I'm pretty easy to find on social media, but if you'd like updates delivered straight to your inbox, why not sign up for my newsletter? I promise not to bombard you with emails; in fact, I don't send out newsletters on any regular schedule (to tell you the truth, I'd rather be working on the next John Pickett than composing a newsletter), but will only contact you when I have a new release, or other news I think you might be interested in. I’m glad you came to visit. 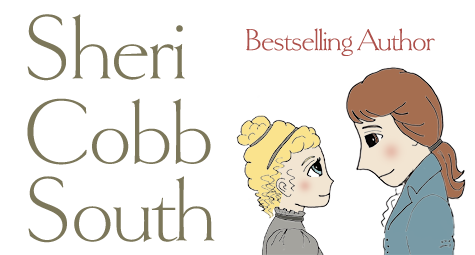 I’m Sheri Cobb South, author of more than twenty novels in a variety of genres ranging from Regency romance to young adult to historical mystery. 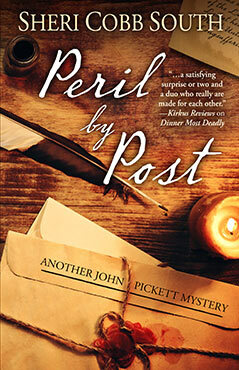 Peril by Post, Book 8 in the John Pickett mystery series, is now available in ebook, paperback, and audiobook editions! See what trouble newlyweds John and Julia stumble upon in England's beautiful Lake District. For more details, or to order from your favorite vendor, click the cover image below. The eighth book in the series finds John Pickett bound for England's scenic Lake District, where an unsigned letter has summoned him for an unspecified reason. Posing as a honeymoon couple, Pickett and his wife, Julia, the former Lady Fieldhurst, take a room at the Hart and Hound as the letter instructs him. Once installed there, however, Pickett can do nothing but wait for the anonymous contact to identify himself. A midnight search of the inn's register seems to identify the innkeeper, Ned Hawkins, as his man, but before Pickett can discover the reason for his summons, Hawkins is pushed from a cliff--surviving the fall only long enough to call Pickett's attention to the letter in his pocket. With his contact dead and his only clue a letter containing nothing more than a rambling account of family news, Pickett knows he's on his own. But that isn't the worst of his problems: Julia saw the crime being committed, and although she can't identify the murderer, there is every indication that the killer knows he was seen--and intends to eliminate any possible witnesses. Amidst a quirky cast of characters including a host of holiday-makers, a bucolic love triangle, an aspiring poet in the Romantic vein, and an old friend of his magistrate, Mr. Colquhoun, Pickett must discover the secret behind that urgent summons before a second, and far more personal, murder is committed. It's been almost twenty years since the publication of The Weaver Takes a Wife, and I'd thought I had said all I had to say about these particular characters—until Lady 'elen's younger brother started insisting that his story be told! When Theo, Lord Tisdale inherits his father's dukedom at age 23, his new responsibilities are enough to send him haring back to London in a blind panic. It's up to everyone's favorite weaver, Ethan Brundy, to haul him back onto the rails, with a little help from a young lady who has fallen on hard times since the death of her own father. 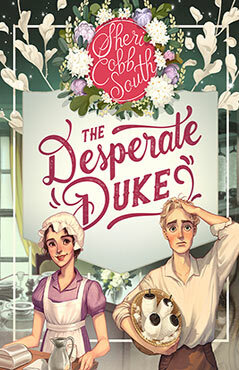 The Desperate Duke will be released on December 15—just in time for Christmas giving, or buying to read on the way to Grandma's house! It will be available through all your favorite vendors (including paperback and, soon, audio formats), and can be pre-ordered from most of them now! Sprechen sie Deutsch? 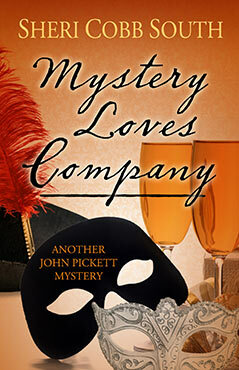 The John Pickett mysteries are being translated into German! 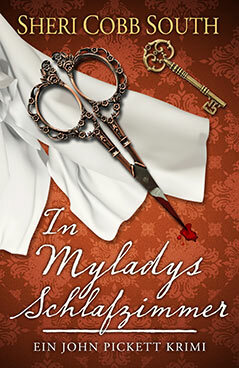 Here's the front cover of In Milady's Chamber. 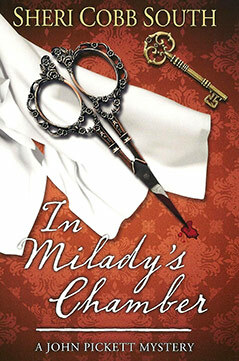 In Milady's Chamber, Book 1 in the John Pickett mystery series. Or, if you'd rather start with the prequel novella, you can do so here. If The Weaver Takes a Wife, voiced by Noah Michael Levine, is more your thing, here's a link to it. If you're new to audiobooks and aren't sure if you'd like them (or if you've just wondered what John Pickett sounds like! 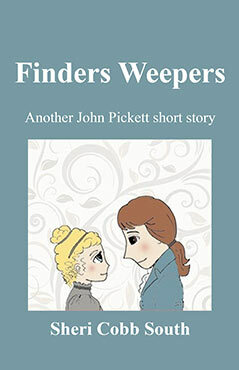 ), here's "Finders Weepers," a free short story for you to enjoy. It's a 35-minute listen (about 15 typed double-spaced pages); chronologically, it follows For Deader or Worse, but it's not necessary to have read that book to understand the story. LISTEN TO FINDERS WEEPERS HERE! After resisting as long as I could, I've finally bitten the bullet and opened a Twitter account. You can follow me on Twitter @shericobbsouth.